At David M. Shore Law Offices, in Oceanside, California, we are committed to helping people obtain the Social Security Disability benefits they need and deserve. Our entire law firm is dedicated solely to the practice of Social Security Disability law, allowing us to maintain a deep and current understanding of the Social Security Administration and its intricacies. If you can no longer work, whether the reason is a mental or physical impairment, we will help you get the benefits to which you are entitled. Too often, disabled or injured workers are denied their rightful benefits. Our law office will help ensure this does not happen to you. Our attorney, David Shore, is an experienced legal professional you can trust. He has practiced law since 1978, having spent more than 20 years dedicated to helping clients with their Social Security Disability needs. He has also spent many years as a dedicated public servant. He served two terms on the city council in Sacramento, where he also sat as vice mayor for two years. In San Diego, he has served as president of the Oceanside Chamber of Commerce and a member of the Oceanside Public Safety and Redevelopment Commission. 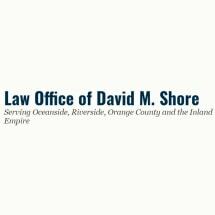 Today, at David M. Shore Law Offices, he helps people in San Diego, Orange County, Riverside County and San Bernardino County with their Social Security Disability needs. If you have a mental health issue or a physical disability that is preventing you from working for a living, schedule a free legal consultation with David Shore at our firm to learn how we can help you get Social Security Disability benefits.